Dozens of people gathered at the memorial near 87th Street and Blue River Road, the former construction site where six firefighters were killed in an early morning explosion. 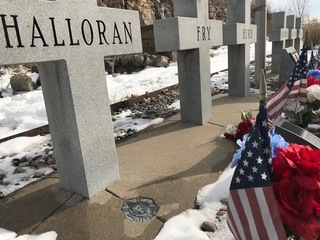 The explosion killed fire captains Gerald Halloran and James Kilventon and firefighters Thomas Fry, Luther Hurd, Robert McKarnin and Michael Oldham. "It was really great to see how the community came together and came to honor these men," Deputy Fire Chief James Dean said. At the time of the explosion, Dean was working at Station 45. "We knew something bad had happened but we really didn't know exactly. We tried to monitor the radio. We only knew that the battalion chief who arrived on the scene wanted to make sure that nobody else came to the scene," Dean said. The investigation determined the explosion was caused by arson. Five people were found guilty of setting a construction trailer, loaded with tens of thousands of pounds of explosives, on fire. It was a tragedy that transformed the job of first responders. "Even though it was a tragedy, it caused significant change in Kansas City, the way we fight fires and gather information, and also the nation," Dean said. Firefighters now train to recognize hazardous materials. Jacqueline Oldham only wishes the change had come before the explosion that took her father's life. "One thing that I'm proud of is when I hear something about 'Hazmat 71,' I know that it came from the explosion," Oldham said. As time goes on, Oldham said it never gets easier, but she is proud to see the community remember a day she will never forget. "I'm just part of the legacy and I'm always going to be connected to the fire department now, and I'm very proud," she said. Of the five people convicted in the arson, three remain in prison serving a life sentence, one died in 2009 and one was released in 2017 after serving 22 years.